The Constitution Bench headed by Justice Dattu today asked the Centre to apprise it by October 10 about the result of political process started by Lt Governor by writing a letter to the President on exploring the chances of government formation in Delhi. The Court also expressed its view that it is not in favour of keeping the matter pending for long. "What is the possible time by which his Excellency would take a decision?” the Bench asked Additional Solicitor General P S Narsimha. At the starting of the hearing, the ASG mentioned the letter written by Lt Governor Najeeb Jung on September 4 to the President seeking to explore the possibility of government formation in Delhi. The LG in the letter had asked for permission from the President to call the single largest party, which is BJP to try and form the government in Delhi, even though when it is short of a majority by itself. Meanwhile, Fali S Nariman and advocate Prashant Bhushan, appearing for Aam Aadmi Party raised the issue of horse trading and said that BJP can’t form a government without horse trading. However, the Bench refused to take on record the additional affidavit filed by Aam Aadmi Party on the issue of horse trading and asked them to wait till October 10. The ASG submitted to the Court that the political process has started again to explore the possibility of government formation in Delhi and asked for four more weeks. 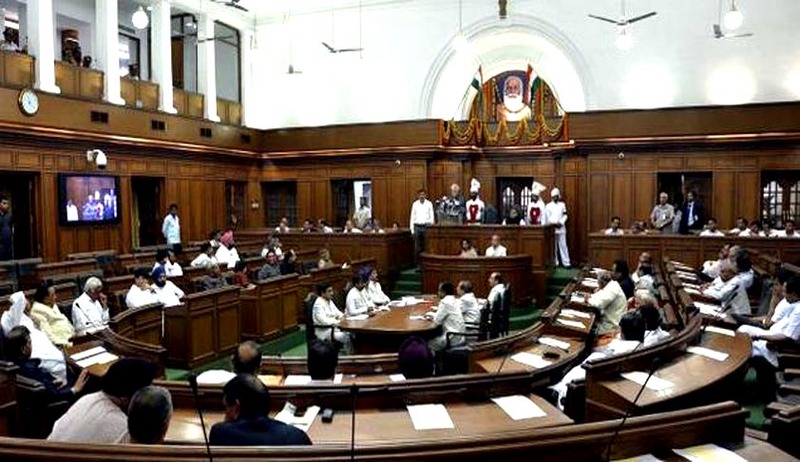 The Court on August 5, had given 5 weeks’ time to Centre to take a decision on dissolution of Delhi Assembly and had even questioned the MLAs’ getting paid from taxpayer’s money for sitting idle and the need for keeping the House in suspended animation, even when no party was coming forward to form the government. The AAP had then pleaded that elections in Delhi be ordered and held in Delhi with elections in 4 other states, later this year. However, the Supreme Court had then rejected this plea. It had said that it is for the appropriate authority to take a decision on this matter. Delhi has been under President Rule from February 17 and after that no party has come up and made a claim towards formation of government in Delhi. The present petition in the Supreme Court has been filed by AAP and seeks directions to Lt. Gov. to dissolve the House and announce fresh elections. AAP had also challenged the imposition of President Rule and had said that the same is being done to protect Congress leaders from charges of corruption. The petition states that the imposition of President Rule is "illegal, arbitrary and in violation" of Art. 14. It has also raised constitutional questions relating to keeping the assembly in suspended animation by ignoring the recommendation of the majority government. After the December polls in Delhi, BJP and its alliance had 32 seats, four short of the magic number. AAP in a wonderful first time performance had got 28 seats while Congress got 8 and the rest were bagged by others in the 70 member assembly. The BJP stands at 28 now as three of its MLAs became MPs after the General elections. The strength of the assembly currently stands at 67.